The global position of the Great Pyramid and its relationship to the megalithic mile relates to the Pyramid’s design. The world’s longest land meridian and the world’s longest land parallel cross in the Pyramid’s base and divide the world’s land and the Great Pyramid into four equal quarters, these lines form a cross inside the base marking the centre of the world’s land. Each line of the cross is 9123.84 inches, this symbolizes two 9123.84 megalithic mile circumference great circles of the earth crossing each other at right angles in the centre of the Pyramid’s base, the two great circles of the earth are shown below. 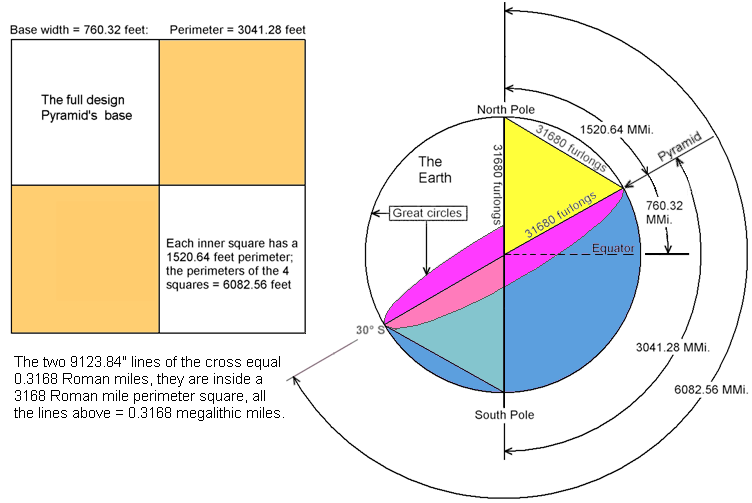 On the scale of a foot to the megalithic mile the basic measurements of the Pyramid’s base and cross are exactly the same as the earth measurements shown below which are relevant to the Pyramid’s global position. 760.32 feet = 1 side of the full design Pyramid’s base. 760.32 megalithic miles = 30° of latitude which is the distance from the Pyramid to the equator. 1520.64 feet = the perimeter of one of the squares in the Pyramid’s base: 1520.64 feet per second was the equator’s rotation speed. 1520.64 megalithic miles from the Pyramid to the North Pole. 3041.28 feet is the Pyramid’s full design base perimeter. 3041.28 megalithic miles from the Pyramid to the South Pole. 6082.56 feet = 1 Pyramid geographic mile and also equals the perimeters of the four squares in the Pyramid’s base. 6082.56 megalithic miles from the North Pole through the Pyramid and South Pole to 30° S. on the opposite side of the world to the Pyramid. The Pyramid is not quite on latitude 30° north but usually it’s global position is given as 30° north, the reason the Pyramid is not exactly on the 30° parallel from the perspective of the Great Design is because the earth has been damaged in a global catastrophe which has resulted in a bulging equator and slightly flattened poles. Therefore the Pyramid’s design shows where the Pyramid would be if the earth was in its original perfect condition this is appropriate because the Pyramid’s design is thoroughly tied to the dimensions of the earth in its original perfect condition. The equator is the centreline of the earth that divides it into northern and southern hemispheres, when it is winter on one side of the centreline it is summer on the other side. The equator rotated at. 1520.64 feet per second, if we move 1520.64 Roman leagues north from the earth’s centreline which is the world’s longest parallel along the world’s longest land meridian we reach the Great Pyramid crossed by the world’s longest land parallel which is virtually a monument to the equator’s 1520.64 feet per second rotation speed; for example the two lines of the cross in the Pyramid’s base equal 1520.64 feet and divide the base into four 1520.64 feet perimeter squares. The journey along the world’s longest land meridian, directly joined the world’s longest parallel to the to the world’s longest land parallel. Note that this joined the earth’s centre line to the centre of the world’s land on the direct line of a great circle, this great circle’s circumference passes through the North Pole and the South Pole and divides the earth into east and west hemispheres, each hemisphere contains half the world’s land, half the world’s oceans and half the Great Pyramid. The full design of the Great Pyramid is amazingly multifunctional and one of its functions is as an analogue of the half sphere (hemisphere) below. The height and base perimeter of the Pyramid are the same as the height (radius) and the base perimeter (circumference) of the hemisphere. The symbolism refers to a sphere half buried in the ground which makes it fairly obvious that the Pyramid in turn symbolizes an octahedron half buried in the ground. Octahedrons are found in nature in the form of mineral crystals, the one below would be classified as a tetragonal pyramid crystal because it has three lines of mutually perpendicular axis, two of which are the same length. If conditions are right all minerals except a few such as opal and volcanic glass form crystals which can be placed into seven systems ruled by the laws of symmetry, this reminds me that the laws of musical harmony place the notes of music on the musical scale chart into seven rows of seven notes. The cuboid below left is the smallest cuboid that can contain the octahedron, it is divided equally into eight smaller cuboids by the Pyramid’s base line and the global factors that divide the world’s land and the Pyramid into four equal quarters (see below). The full design Pyramid’s base has a 3168 Roman feet base perimeter and each quarter is a 0.3168 Roman mile perimeter square which has 31680000 hundredweight of solid limestone resting on it or it would if the full design had been built. The Great Pyramid’s full design requires 6336000 tons of solid limestone to build, it has a base perimeter of 0.6336 Roman miles = 633.6 Roman feet, its volume is 0.0006336 cubic miles, each of the squares in the base is 63.36 fathoms x 63.36 fathoms and adding their perimeters produces 6336 Roman feet which is very appropriately 1 Pyramid geographic mile. The volume of the Pyramid is a play on the fact that there are 63360 inches in a mile therefore a cubic mile is 63360” x 63360” x 63360” and if we multiply this by 0.0006336 it produces the volume of the full design. One Pyramid geographic mile x 1 megalithic mile produces π² miles meaning pi square miles or 864/275 square miles which is the surface area of a 63360” (mile) diameter sphere and this is an inch to the furlong scale model of the 63360 furlong diameter earth, the model fits perfectly inside a cubic mile which is referred to by the Pyramid’s volume. A 63360 furlong diameter equator rotates at 6.336 megalithic miles per minute which is the distance from the centre of the Avebury monument to Stonehenge’s centre, the Sarsen Circle symbolizes a 633.6” sphere inside a 633.6” cube, if we multiply the cube’s volume by 633.6 it produces the volume of the full design Pyramid. In other words the Sarsen Circle symbolizes a model of a mile diameter sphere inside a cubic mile, this is also symbolized by Silbury Hill’s design.